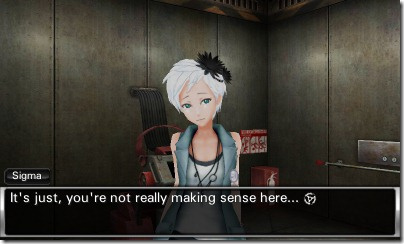 Zero Escape: Virtue's Last Reward is now available on the 3DS eShop in North America, offering another avenue to this well-received visual novel/puzzle adventure. Players of the original physical copy of the game, however, have been wondering whether the download version still contains one grief-bearing issue: a save-corrupting bug that's rather inescapable if you trigger it. According to Aksys Games' Facebook page for Virtue's Last Reward, the bug has been fixed in the eShop version of the game. Unfortunately, the same page has been receiving complaints from people who claim they have downloaded the game and still hit the glitch. So, what to do? If you have already purchased Virtue's Last Reward or plan to, it may be best to treat the eShop version as if it was glitched until further confirmation is received that things are indeed fixed. This means that you should not save in the PEC (Pressure Exchange) or Crew's Quarters puzzle rooms. If you want to be extremely safe, save only in the story sections of the game. This advice still goes for physical copies of the game as well, as they have not yet received a patch. Are you still interested in Virtue's Last Reward even with a potential bug? Let us know. Completely agree, the characters were much more likeable in 999 for one. Also it annoys me that there's no English VA on the PAL version. I'm thinking of getting it but never played the first one. Is this worth paying $24.99 for? Why are these things NOT patched? I'm still upset that I have to cycle to English then back to Japanese every time I turn on Fire Emblem. These are simple bugs that can be fixed with a patch, but despite Nintendo's claim of better after market support, patches for games on Nintendo systems are still pretty nonexistent. @DarkKirby I've actually never heard of that glitch before, is it just you or do you know of anyone else that has it? Um, what?! There's a Fire Emblem language glitch? What happens? I've never noticed it. Anyway, this is unfortunate, but I'll still get this hopefully. It looks amazing. @mumof3kids82 Its best to play 999 first. Its rare to find, but rewarding to get. I want to give this game a try but at $15 max. $10 and I would download it immediately. Despite it having a huge (but circumventable) glitch. @DarkKirby Exactly. I suffer from this bug, too. Also, there is another bug in Fire Emblem Awakening (NA version only), that if your streetpass team has any paid DLC or spotpass characters (characters from previous titles, not additional side quest chapters), anyone who streetpasses you will only receive a random team instead of your real team. Just think about have you ever received any team with DLC or spotpass character, and you can confirm it. @TheLilK98 @WinterWarm There is such glitch, but only if you choose to use Japanese voice, so maybe that's why you never heard it. If you choose Japanese voice, each time you exit or reset game, although in the settings it still set as Japanese, the actual voice is English. The only solution is changing voice language twice each time before you load game. I really hope some version of this game eventually gets that bug patched up. People deserve to be able to play games without having to worry about walking around a game-breaking glitch. @TheLilK98 I think that's the reason. After you watched the movie, you probably switched the language back before you got the chance to notice that glitch. @mullen Yeah, that's probably it. @mullen - I get lots of teams with the DLC skills actually. Surprising number of players use All Stats +2. Resistance +10 appeared once. Got a Dread Fighter or two and a bride. Spotpass characters I'm yet to have show up but I have had people with Avatars from other players sent many times, strange seeing a weaker version of yourself. Which of course means my team isn't getting scrambled, so I don't think that is a glitch, unless maybe it is from not having the same dlc/spotpass content. The price is nice but I still have no interest, especially with that glitch. To be fair to the Developers, Patching Hard Copies is not as easy as it sounds. First of all, they need to find a fix. That seems to be what is causing them the most trouble. But even if they do, they need to apply it. Now, most games from the newest generations look for patches stored externally (a big one from recent memory is Shin Magami Tensei IV which looks on the SD card) But if the game is NOT programmed to do that, it is a great deal harder as the game Carts Can not be modified in any way, they are ROM. I suspect that the company has a method of patching carts available and are simply stuck in the bug itself but who knows. Furthermore, the ZE series is not well enough known to have the backing many large franchises have which allows them to pay more towards fixes. if they do find one, the DL version is the most likely to recieve it. Incidentally, While I have not had the bug and saved in every room i have done except the PEC (haven't done the Crew quarters yet) I hear it can happen elsewhere, i found 2 accounts in the rec room and one in the pantry. so i don't plan on puzzle room saving unless i HAVE to. One last thing, i heard that some games glitched during story sections and resulted in a bad save somehow. I do hope they find a fix but I am, not holding my breath. @Marioman64 Exactly, The Problem with saves is it has to remember the Exact state of so many things, making it more difficult the more things it has to look at and VLR has Story locks, endings, paths, notes, and ALL the things that can be shifted in puzzle rooms plus more. My suspicion is that the glitch is most common in rooms with large amounts of things you can change. i have not done the crew quarters yet but the PEC room had its fair share of changeable things. This theory of mine would explain why the likelyhood of the crash is reported to go up as your total playtime increases, simply put, the longer you have been playing the more "dynamic things" it has to track the changes to. I got the this game when it first came out here. I enjoyed it a lot, but I ran into that glitch and had to start all over. Try not to save you're progress in any puzzle areas. I don't think this glitch is in the Vita version. This stupid save glitch happened to me after 16 hours into the game! I was in such a rage! Playing from the beginning now, making a save only at the end of each story branch. And yes, 999 is better so far. Glitch or no glitch, everyone should play this regardless. Just don't save in puzzle rooms. 1. I'm still trying to understand why you would want the game in Japanese. 2. I actually have proof your statement of the StreetPass glitch is false. The proof's called SkywardLink98. He 'StreetPass'ed me and fought my Dread Fighter avatar, although he did mention he couldn't recruit him. I quite liked the japanese voices, felt like everyone was japanese and I just ad the translations. Such a great game though, I had no idea what to expect when I started playing but I couldn't stop playing after a few hours into it. @Irbricksceo: In regards to patching hard copies, couldn't the publishers/developers simply enlist the help of Nintendo to perhaps release a free eShop launcher app that detects a physical Virtue's Last Reward cart and get that glitch fixed that way? It was a relatively early 3DS title afterall. Maybe they could have it run in the background? Even if you had to launch the game using that app every single time, at least the glitch would be fixed then wouldn't it? I mean, it may not be the most elegant solution, but it'd be worth doing for those that bought the hard copies instead of just leaving them with a bad taste in their mouths. For the streetpass, please read my description again. What I said is CHARATERS, not DLC classes or skills. There is no problem with the additional classes or skills, but you can't have DLC characters, like Marth, in your team. I also want to claim that this is a known bug only for US version; you can find that in wiki sites. EU and JP versions have no such bug, you can have DLC characters in your team without any problem. For WinterWarm's first question. There is such options, so that's why certain players want to use them. If it's totally useless, developers have no reason to include it. My reason is that Japanese voice actors are much better. Whatever, bug is bug, you can't deny it. @Expa0 English dubs are bad, I'm glad there are japaneses voices. I think i got this game free, a while back. Need to buy the first game at some point. I knew about this glitch in advance and never saved in the puzzle rooms. My copy must be free of glitches, though, as my brother-in-law played through it and saved in ALL of the puzzle rooms (yes, including the PEC and Crew Quarters puzzle rooms) and never had an issue. The only problem I ever had with the game was it crashing during the puzzle with the dice. It don't see it ever going that low. In all honesty, even with the possibility of running into the glitch, the game is still more than worth the $40 I payed for it. Absolutely the best story you'll run into in a 3DS game. @Ralizah Does 999 need to be played to enjoy this one? Its at my local Gamestop and I look at it all the time lol. Don't want to pay 25$ for it use is all my hang up. Nah. There are some revelations near the ending that are more meaningful if you've played 999, but VLR's story stands on its own. My brother-in-law never played 999 and enjoyed the heck out of VLR. VLR is one of the best games on the system. Get it! Just don't save in the puzzle rooms. Interested in this game even with the chance of a save glitch. I don't think I've played anything like it. It's a puzzle/adventure game? Is it frustrating hard at times? Ok read the review again and looks like there are hints to help you through. sounds like an interactive story with puzzles. Can anyone confirm the US E-shop release still has the Japanese voice option? English isn't my first language, so American dubs sound very unnatural to me. @silly You can choose English or Japanese voice acting in the e-Shop version. I LOVE THIS GAME. It is taking over my brain and I can't think about anything else!! !